Let’s face it — kids go for taste, not necessarily nutrition. 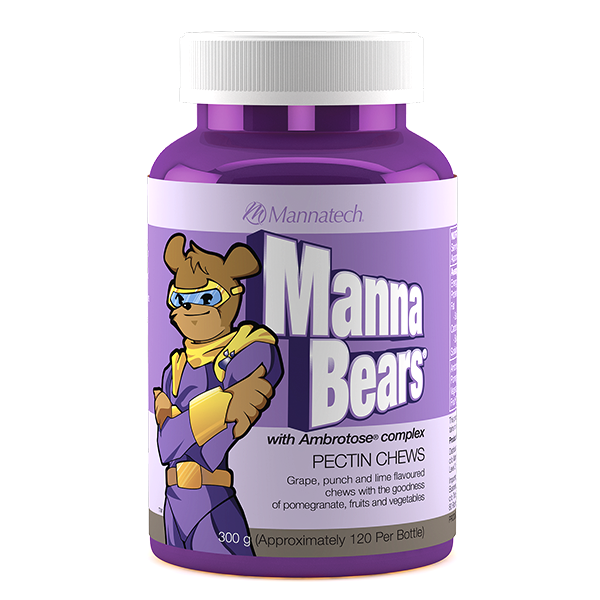 MannaBears supplements have been formulated to provide the nutrients of 10 different dehydrated fruits and vegetables to support the nutritional needs of a growing body. Healthy and delicious MannaBears supplements are designed to give kids of all ages a nutritional and tasty snack full of nutrients from real fruits and veggies such as broccoli, brussel sprouts, cabbage, carrot, cauliflower, kale, tomato, turnip, papaya, and pineapple. Adults can eat them too! Tapioca syrup, raw sugar, water, Ambrotose® complex* (contains vegetable gums [pectin, gum acacia, gum tragacanth], xylitol and aloe vera inner leaf gel powder), acid (citric acid), pomegranate powder, natural flavours, natural colour: anthocyanins, vegetable powders (Brussel sprouts, broccoli, cabbage, carrot, cauliflower, kale, tomato, turnip), fruit powders (papaya, pineapple). Why are Manna•Bears® coated with crystals? Evaporated cane syrup crystals dusted on the bears keep them from sticking together, allowing them to remain at peak condition during shipping and storage. Why was sucrose included in Manna•Bears supplements? To provide a vegetarian product, we chose pectin (which has many health benefits) as the jelling agent in the new bears. Pectin requires sucrose to jell. In addition, the sucrose dusting on the outside of the bears is necessary to keep them from sticking together, allowing them to remain at peak condition during shipping and storage.